Amazon has just introduced audio and video to the Kindle e-reader, although the features will be limited to those using Kindle on Apple's iPhone, iPod touch or iPad. Adding voice narration to digital books on your iPhone, iPod touch or iPad is certainly going to be a feature that many users will value, particularly in such things as travel guides and instructional manuals. 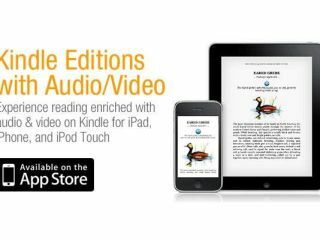 "We are excited to add this functionality to Kindle for iPad and Kindle for iPhone and iPod touch," notes Dorothy Nicholls, Director, Amazon Kindle. "Readers will already find some Kindle Editions with audio/video clips in the Kindle Store today--from Rose's Heavenly Cakes with video tips on preparing the perfect cake to Bird Songs with audio clips that relate the songs and calls to the birds' appearances. This is just the beginning--we look forward to seeing what authors and publishers create for Kindle customers using the new functionality of the Kindle apps." Rich Steves' London Kindle Edition, for example, offers users walking tours of the capital with the author narrating as you perambulate ol' London town. Bill Newlin, Steves' publisher at Avalon Travel, notes that: "Rick's narration adds depth to the reader's experience, while listeners can follow the routes more easily with the text." Perhaps the strangest aspect of Amazon's latest move is the fact that video features can only be accessed on Kindle publications via the Apple apps the company has developed, with its own dedicated Kindle device limited (right now, at least) to basic e-ink, regular audio books and its text-to-speech function.